Essence Featured! December/January #BUYBLACK Gift Guide. Michelle Obama graces the cover. Flip to page 40 to see the model rocking our “Progression Hoop”. The geometric design is the classic hoop reimagined, signifying the process of gradually moving forward. Inspired by nature, the circles represent the 9 planets in the solar system. Visually representing the power we all possess. We couldn’t be more honored to share the same issue with THE MICHELLE OBAMA! Thank you Essence. This year has been an amazing whirlwind and we are excited to end the year with an amazing feature. Essence Fest 2018 is now apart of the list of things we wished to check off the list as a brand. The last few months have been all about Essence and now that it is officially over we want to share our favorite moments from the festival. It was our first time at Essence Fest as a vendor and we were overwhelmed by all the love and support we received. Thank you to everyone that stopped by our booth and shopped with us! If you weren't in NOLA, don't worry here's what you missed. 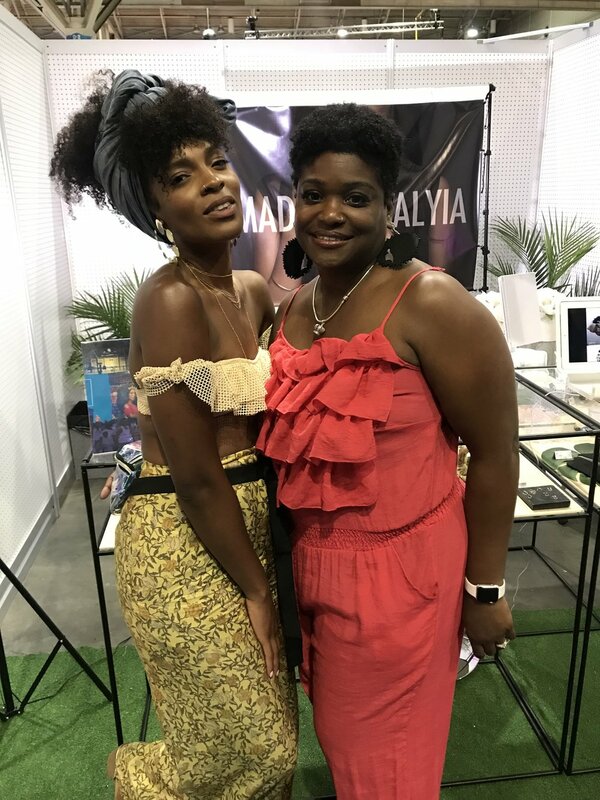 Founder Malyia is also a signed model and she walked into the Convention Center to see herself as a 30 Ft Billboard Ad for the Walmart "Reign On" campaign. The universe connected her two loves modeling and jewelry design under one roof! We met so many dope jewels and supporters of the brand. Essence Magazine's Beauty Director Julee Wilson stopped by and complimented our display! Check out the recap through photos below. Jewel rocking our brand new "Progression" hoop earring. Showing a jewel how to put her new "Divergent" Earcuff on. Jewel rocking her new "Single" hoop faux nose ring. It looks real to us too. We are so excited to announce your favorite black owned jewelry designer is setting up shop in New Orleans for the 2018 Essence Festival July 6-8. Essence is synonymous with Black Excellence and this year will be no different. It’s the place to link up and lift up each other. Beyond the shopping and social aspects expect performances from my icons like Janet Jackson, Erykah Badu, Mary J. Blidge and many more. This is just the next chapter of a relationship with Essence that goes back years. MADE by MALYIA linked with Essence Mag for the Essence Street Style Block Party in Brooklyn. Growth is never easy...but we are grateful for all the beautiful things that have come to fruition as a result of our partnerships. There’s a first time for everything...And we couldn't be more excited! Join us this July 6-8 in New Orleans for the Made by Malyia x Shops at Essence Festival. This is one you don't want to miss. On the last day of February, we ended black history month with BuzzFeed's #BuyBlack Pop-up shop! The amazing editor's at BuzzFeed brought together a collective of small black-owned businesses. This moment was a full circle moment for us, last year BuzzFeed featured our brand 9 Beauty And Style Products You Didn't Know You Needed Until Now. It was one of our first major features and they have continued to highlight and support us. My friend Jaime came by! Made by Malyia Jewel rocking her new Single hoop Faux nose ring. Looks just like the real thing. My friend Candace stopped by to show some love! At last years Afropunk I met a jewel attending the festival from Denver Colorado. She initially recognized me as the natural hair model from the Today show 60 second hair segment gone wrong. After we discussed the show, her friends shopped the collection and we exchanged contact information. When she reached out a few months later to ask if I would be interested in hosting her launch party for Curls on the Block x Crowned Curls in Denver Colorado I immediately said yes. Both companies mission is to promote positive images and self-love for natural women of color. Curls on the Block creator developed a curriculum incorporating STEM to educate young girls about natural hair. I had an amazing time at the event. Check out the photos from the event below! I was a keynote speaker for the Forward Conference in Washington, DC January 6-8. A 3 day interactive experience featuring 4 keynote speakers and 30 guest speakers provide inspiration and insight on how to move ideas forward, successfully. NBTM the company behind the conference connects individuals of varying ethnicities, socioeconomic levels, life aspirations, and career achievements helping them to hone their ideas and creative abilities, through a supportive, global network. I had the opportunity to connect and share my journey with young professionals. It was an honor to share the stage as a panelist with Miss Jessie's Founder Miko Branch. As a young entrepreneur it was inspiring to sit next to a pioneer. The weekend was inspiring and I left feeling re-energized. The next Forward Conference is March 2018 in NYC, mark your calendars it will be one you don't want to miss. Visit the Forward Conference website HERE for more info. Check out pictures from the conference below! Year Review: Jewels Thank you for ROCKING with us in 2016! Jewels I can't thank you enough for making 2016 the best one yet. This year was truly a journey and marked my year anniversary as an entrepreneur. One of my goals when I started Made by Malyia was to be able to bring everyone along on this journey as I grew the brand. None of this would be possible without your consistent support so I wanted to review the year and let you know what's next for the brand. I started off the year with a modeling contract that was made possible because of my appearance at Afropunk a few months earlier. I released a new collection and was featured by several blogs. In June my jewelry as well as myself was featured in the Colored Girl Campaign. The campaign was featured by Teen Vogue, Cosmopolitan, Instyle, Essence, Yahoo Beauty and many more. I was the natural hair model on the Today Show Summer Hair styles segment in August that went viral, the segment didn't go as planned, receiving over 10 million views. At first I didn't want the segment to overshadow the progress I made with the brand. 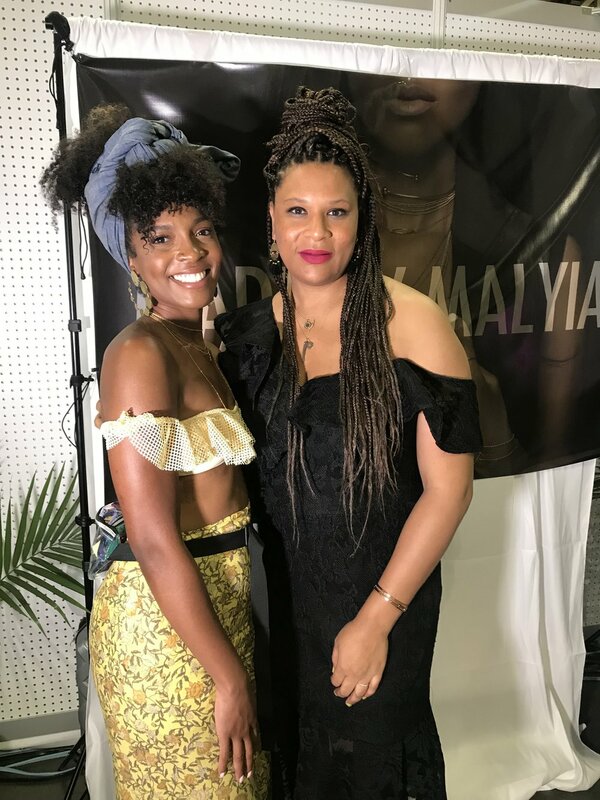 When people started to leave comments asking where they could purchase the jewelry I had on the show, which of course was the full Made by Malyia collection, I knew my hard work wouldn't go unrecognized. I returned to Afropunk in Brooklyn for the second consecutive year as vendor. I received more overwhelming love and support. I kick of the year as Keynote speaker in Washington DC. at the Forward Conference January 6-8 2017, where I will be sharing my journey and how to live your best life. I will be hosting the Curls on the Block Launch party in Denver, Colorado January 28, 2017. I will be releasing a new campaign and much more. Jewels, Thank you for rocking with us. Here's to making 2017 even better. I hope this is the beginning of many more speaking engagements to come. Wish me luck! On Saturday September 24, 2016 I was selected as an honoree by Women by Choice, a women's empowerment and networking event, on the Stepping N2 Sisterhood Tour NY stop. View more pictures from the event!